GWP Architecture is delighted that Manchester City Council has unanimously approved our Birley Fields Student Accommodation scheme at Manchester Metropolitan University. 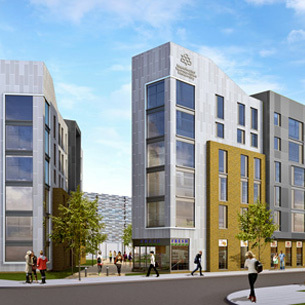 The 1,200 bedroom scheme which is also targeting BREEAM ‘Outstanding’ follows on from successful partnership with GB Building Solutions on ‘The Green’ at University of Bradford, which won the BREEAM Multi Residential 2012 Award. The accommodation is provided in 12 bedroom Townhouse units and 6?? Bedroom Clusterflats. The Townhouses are designed to create a sustainable living environment based on the family home. Each townhouse has a shared kitchen, dining and living room on the ground floor with bedrooms and shared WC/shower rooms on the upper floors. The clusterflats arranged horizontally and comprise of en-suite bedrooms that share a communal kitchen, dining and living room. Birley Fields is intended to be a zero energy, waste and water campus. The accommodation will benefit from a district heating system provided by the new energy centre. All bedrooms will have a greywater system and GB Building Solutions plans to recycle 98 percent of waste generated during construction. Birley Fields is the largest construction project in the University’s 10 year plan to consolidate seven campus locations into two. Construction of the accommodation is scheduled to start in March and completion is planned for August 2014.